Lipsticks and Lashes: My Summer of Music! So as I mentioned last week in my grand return to blogging I have been MIA for the past 6 weeks! Where have you been? I hear you ask! Well I have been having a super summer of fun! I have been on adventures most weekend and having a blast! I have also seen a lot of bands recently and thought I would share it on here with you all! Let’s start with my favourites! I managed to blag tickets to the Foo Fighters, I have been a huge fan for years, and I couldn’t have asked for a more amazing show! And I’m also ridiculously lucky that my main man Dave hadn’t broken his leg yet! Yes I am very smug that I got to see them and so many of my friends missed out! They are hands down one of the best bands I have ever seen live, there is no fancy dramatics it is purely them rocking out and doing something they love, it is AMAZING! I also have a massive crush on Mr Grohl and his super shiny soft looking hair, swoon! Next up I went to the Capital FM Summer Ball, my friend got us tickets and I have to say I enjoyed it so much. I thought there would be a lot of waiting around between acts but there was no such hanging around, the bands came on, played a few of there best songs and on came the next act. It was fantastic and I never thought I would say this out loud (or in public) but I think One Direction were great! They really knew how to work the crowd and you could see they were enjoying what they were doing. Another of my faves from the line up had to be Neyo, I have loved him for years and he didn’t disappoint. Then a week later I was back up to London to see Take That at the O2. WOW just WOW! I’m a fan from way back in the day and I’m pleased to say the played all their hits. When I say they put on a show they really do, they had all sorts of performers and there was so much going on you didn’t know where to look. It really was incredible! Finally last weekend I went to my first ever festival, Blissfield’s a couple of weekends ago and it was awesome! It was a small, quirky festival and was pretty cool. 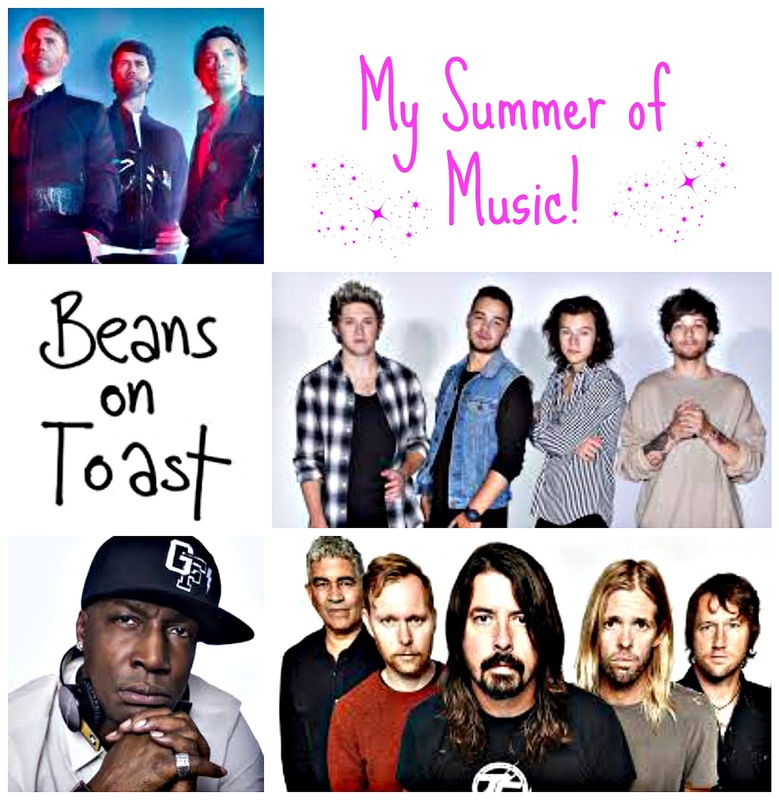 My favourite acts had to be Beans on Toast, go check out on spotify now, just so spot on and then another top act of the weekend would have to of been Grand Master Flash. Absolutely blooming awesome! He was just such a decent guy and he really got the whole audience bouncing. What a few weeks! I love a wide range of music as you can tell! Music really feeds my soul and is such a big piece of my life. What bands have you seen lately? Any recommendations? I have to admit to a liking for 1D, too! Good pop music is good regardless of who it's by.